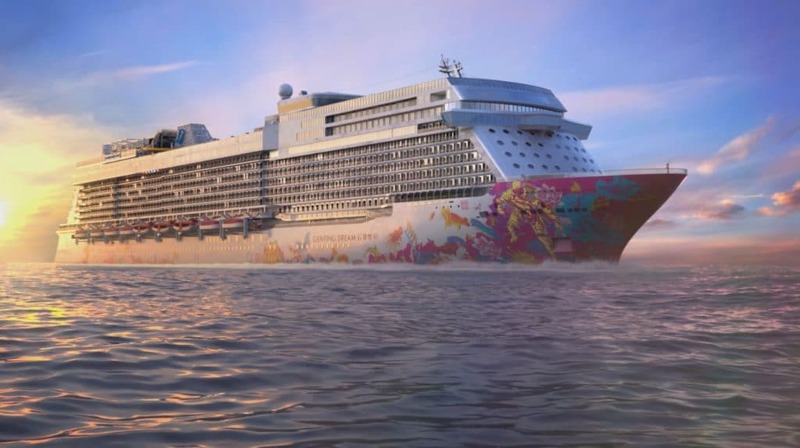 Asian based Dream Cruises has launched a new ad campaign in anticipation for its new Genting Dream cruise ship. Inspired by the dramatic hull artwork of Chinese pop-artist Jacky Tsai which adorns the hull of Dream Cruises’ inaugural ship Genting Dream, the campaign features an emotive love-story between a mermaid and an astronaut. The campaign is called “The Mermaids Dream” and is a ground-breaking commercial to showcase the recently formed luxury cruise line in China. The campaign, developed by Leo Burnett China, features a visually striking brand advertisement and video commercial aimed at the ‘emerging generation’ of independently-minded affluent leisure travellers looking for sophisticated new luxury vacation experiences. An accomplished international film director brought the epic story to life in truly cinematic fashion, which involved space cinematography and computer generated 3D graphics as used in the award-winning movie ‘Gravity’. “There seemed no better way to launch our brand than by bringing to life our brand icon, the mermaid, and the incredible story of our hull artwork. The seemingly impossible romance between a mermaid and an astronaut is imaginative, captivating and inspiring – and these are all elements that we believe represent the experience of a luxury cruise on board Dream Cruises. To differentiate our brand as unique in the market, we wanted to dream big so we adopted a bold and memorable storytelling approach that stands out from the competition, breaking away from traditional brand commercials in the sector that invariably present a cruise ship video tour”. The commercial will air as 30-second and 15-second spots on traditional and online broadcast channels, supported by an integrated print, outdoor, digital and social media campaign, with an extended minute-long ‘mini-film’ version of the epic being released at a later date. Genting Dream just floated out of its German shipyard for the final phases of construction. The 151,300 gross ton vessel will make its debut in November with cruises out of Guangzhou, China. One of Asia's most luxurious cruise line Dream Cruises has welcomed its third cruise ship to fleet named Explorer Dream. Construction starts on first 204,000 gross ton Global Class cruise ship for Asian based Dream Cruises. The ships will feature the first public escalators at sea and offer an advanced cruising experience with Artificial Intelligence. Dream Cruises has officially welcomed its newest cruise ship in Hong Kong. It has been purpose-built for the Asian market.